Mobile apps have become a great business proposition for the purpose of providing core business services to the general consumer. They provide personalized user experience, act as an effective platform to connect directly with customers, and often come with features which seamlessly utilize mobile device features. Apps have emerged as a game changer in building brand reputation of businesses and provide customers with intuitive and friendly customer experience. Developers must institute a foolproof way of handling and storing all user information collected by the application in a secure manner. Adequate safeguards should be adopted to prevent personal identifiable information (PII) from being stolen for identity theft and fraud. Increasingly, many enterprise applications are beginning to integrate financial transactions in them, which invariably leads to accessing crucial personal information of users. It becomes imperative that such sensitive information is handled properly, without data leaks and unauthorised access by third parties. A company’s reputation and branding depends on how its app protects users’ data, with all security solutions in place to prevent any malware injections or hacking attempts, apart from giving a great user experience. The company should remember that in an open, connected world, there are rivals as well as ethical hackers working overtime just to ensure that a big brand does not slip. Apart from losing crucial user data, the loss can come in the form of both misuse of user information as well as lawsuits from affected parties. While the positive of undertaking security drills is that customers stay loyal and trust the brand, the negative is the loss of customers’ confidence forever. A mobile app is the intellectual property (IP) of a company, and all the code and knowledge that goes into its development is owned by it. However, IP theft is as common an occurrence as is physical theft. The onus of preventing IP theft through provision of creating a tamper-free environment and securing applications and data against exploitation is on the company that owns the brand. The company should understand that it is not just a moral responsibility but well-defined legal onus as well. Revenue targets and profit generation derive from a brand’s reputation and customer satisfaction. A secure and robust mobile application can be a big differentiating factor in delivering a superlative customer experience in an already crowded app marketplace. In the light of contemporary security challenges, traditional cybersecurity approaches often fall short of providing solutions which are secure enough to protect mobile applications. They limit themselves to securing the network perimeter and depend on firewalls and anti-virus applications. Even if developers adopt secure coding practices from the very beginning, they do not act as a dependable shield against evolving security threats that have to be countered as soon as they show up to prevent any major losses. In the contemporary age of persistent hacking and phishing attempts, security solutions must be a step ahead to effectively deal with such intrusions. A dynamic solution, thus, must anticipate threats and create a protective shield around apps much in advance. AppSealing aptly fills this void through an effective, comprehensive security solution suite. 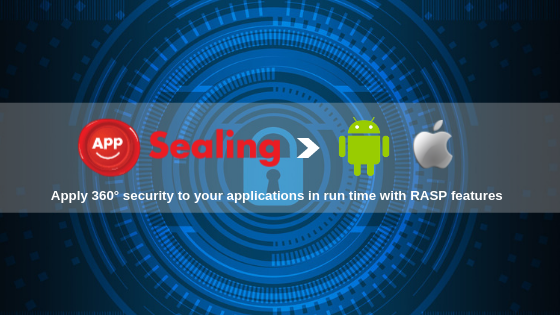 AppSealing provides wide-ranging security offerings for different app genres, ranging from games, fintech, finance, ecommerce, O2O, and cryptocurrency, bringing to the plate the Runtime Application Self-Protection (RASP) feature. Being a cloud based solution, developers and brands around the world trust AppSealing for securing their apps. Its “pay-as-you-go” model provides price flexibility affordable to indie, small and big publishers.. A range of integrations with the development environment ranks AppSealing as one of the most intuitively designed mobile security solution in the market. Setting up security features to your Applications is as easy as 1-2-3. Creating security solutions that are powerful but at the same time easy to use has been AppSealing’s motto. Using AppSealing, developers the world over secure their mobile apps’ code effectively through DEX, SO, and DLL file encryption and prevent reverse engineering through binary protection, anti-decompilation, and anti-debugging. AppSealing maintains the mobile application’s component and module integrity through strong hash validation with reasonably strong cryptographic key management. It promptly detects rooted devices and access attempt by emulators and blocks the launch of the secured app immediately. This prevents unauthorised use of app’s codebase. AppSealing ensures that an ever-listening tamper-detection mechanism sits over the mobile app, so that any malicious access can be tracked. This ensures real-time app integrity and prevents illegal app distribution. AppSealing is globally relevant and compatible with major third-party libraries. This helps in extension of its capabilities and enables an all-round app protection. Developers get unique insights for enhancing app’s security that other security solutions seldom provide. AppSealing strives to maintain a perfect balance between app security and performance. In this pursuit, the app’s real-time performance is not impacted. AppSealing has minimal impact on the app’s runtime performance, keeping memory overhead as low as possible and ensuring least battery consumption. Through dashboards and weekly/monthly reports, developers get to view a synoptic view of hacking attempts made against their mobile apps. AppSealing provides real-time data on app threat status. These inputs often aid in taking crucial business decisions and guide mobile app security to a higher pedestal compared to other apps in the market. AppSealing’s large clientele base spread over varied domains is undeniable proof of the positive impact it has had on their business operations, profitability, and brand building. AppSealing has been actively deployed on premium gaming apps, like Icarus M, Grand Chase, Mobile Premier League, Three Kingdoms Online, Tango5, Phantom Chaser, Heroes of Dynasty, Miracle, etc. Apart from them, Winzo Gold, Subway GoGo, Reverse D, Grow Palson, and Three Kingdoms: Infinity Challenge are also protected by AppSealing. It’s high time you adopt AppSealing for your mobile app and visualize the first-hand magic of AppSealing securing your app on in real time. Start your Free Trial Now or email us at contact@appsealing.com.